I was out 12 weeks with one respiratory infection after another. I lost enough weight that I fit the medical standards of "underweight"and "anorectic!" I've really only been able to run this past week and have finally made it up to 3.5 (slow) miles. But that gives me a reason to explain how I build mileage. The first day back, I do whatever I can. After that, every day I head out and, if I run the same distance as the day before in less time, I stop; if not, I run 10% further (to whatever seems like a good place to stop, usually the nearest 0.5 miles). This seems to work well for me for a few weeks, when I can start thinking about pacing and actual plans. It usually falls apart when there's a bad stretch of weather - and a blizzard is predicted for tomorrow. This time, however, I've had to make another concession to getting older. I follow the plan above only every other day; alternate days, I run whatever feels comfortable. I have a 4 mile race scheduled in 19 days; I only plan to finish,not race. There are so many races in Minnesota now that, if you chose to run a 5K in Minneapolis on a given Saturday, it may not be the only one. The number of choices dilutes the racing population, so that you may not be racing against someone you ordinarily would race, unless you co-ordinate beforehand. Because of this, two methods have developed to get the same sub-populations racing each other: race series and teams/clubs. In the early 1980's, most of the established races in the Twin Cities were in the western suburbs. There was a group of competitive runners near White Bear Lake, on the northeast side, and a series of races was developed that kept them running against each other. It still sort-of exists, but it fell apart, because there wasn't much to keep it going. Similarly, there was a series (and it too sort-of still exists) on the south side, in Lakeville and Farmington. The MDRA has its own statewide series - largely in the Twin Cities and it has the same general pattern as the others: one race per month, of varying distances; the MDRA series uses some of the largest races in the state, most of which have become rather expensive. There are enough people in each of these races that it's unlikely that one will interact with the same ones in several races. In 2003, I entered a series of trail races held throughout Minnesota, of 5K to 1/2 marathon in length (and won my age class). Trail races were still small enough that one could meet all of one's competitors before or after the event. When the UMTR was being formed, I organized a series of races of 50K and 50 Miles in Minnesota and Wisconsin, as some of these were in need of entrants (a few decidedly were not) and it was a good chance for people with one particular favorite race get to meet others and try different events. Trail ultras exploded in popularity just after this and I left the management of the series when someone got involved whose only interest seemed to be marketing. The trouble with these series is that they require one to race well at a variety of distances and over several months. Fortunately, there are now a few series of a few races over a few weeks (the Endless Summer series of trail races, for example, or the Lake Como Relays). Teams are a second way of finding one's own people at races. Unfortunately, most teams are made of a few extremely talented runners who get free gear for wearing advertising of those who supply the gear. 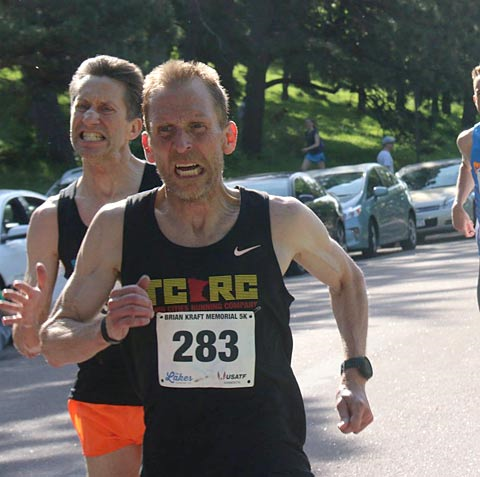 Clubs are much less formal and often have a much larger number of members; there are weekly runs in the Twin Cities by clubs that have hundreds running each week. These people can identify each other at races by wearing team clothes, but most frequently, they communicate after the event has been over for a day to a week; they rarely are "competing" against each other - it's more of a social support network. What I've been trying to find a way to bring back is frequent short races, where one has an incentive to do one's best (rather than just participate) and where one sees the same people and it's possible to interact with them before or after the event. There are some efforts being made by a number of people to bring this about. One good example of how to do things right is the NMTC fall and spring race series in the Duluth area. To get around liability insurance waivers, the races have no entry fees, but ask for a suggested donation to defray costs (I see they now have waivers for when you enter the series). The races are low-key, but competitive, and average 100-200 finishers. I'm hoping to create something similar here in the Twin Cities. If I add another post to this series, it will be of courses I'd like to see made into races. This is going to make everyone's eyes glaze over, I'm afraid. There are limits to the size of the field of entrants in a race, mostly determined by bottlenecks in the width of course. Trail races usually start in an open field or on a street, giving runners a chance to spread out before they hit single-track trail, where too many runners cause people to have to wait. It's easy to find track races where they let too many start; though the course is 8 lanes wide, the effective width is only 2, and only 1 on the turns; too many runners leads to bumping and often to falls. Road races, when they grow unwieldy, have staggered starts. The NYC Marathon, for example, starts wheelers, then elite females, then elite males, then everyone else (from two different start points). This is to cut down on accidents from crowding and, to a lesser extent, to cut down the time people have to stand around waiting to be able to run. The problem with this is: if you didn't start at the same time and run the same course, you weren't in the same race; a great example of this was the Melpomene 5K held decades ago in Minneapolis, where one year the women ran, then the men ran separately, but it rained during one of the races. If you combine the results of multiple heats, as is done with some races, like the Meet of the Miles, you still don't get a normal distribution, but people bunch together at specific goal times. There is an ideal race population, which is rarely achieved. The number of finishers should form a normal curve of distribution when plotted against the logarithm of time. The math of that is horrible, but fortunately the middle 25% of finish places form a straight line plotted against the logarithm of finish time. Almost no races actually fit this profile (the Brian Kraft 5K is the only one in Minnesota that regularly does), for a number of reasons. First, you have to have a lot of runners, thousands, to form a smooth distribution. Second, there can be no "ringers" brought in. Then, everyone has to be competing to run as fast as they can; this, in fact, is the major reason it doesn't work in marathons, because the majority of runners don't care when they finish, just that they finish. Very long races have the problem that the first runners often run alone, with hours between finishers. If you can't see the runner ahead of you, you rarely are racing them. Generally, in track races, "losing contact" happens with a gap of 10 seconds. As I said in the first post in this series, several runners finishing per second can't be considered racing, either. So, ideally, you want 2-10 seconds between runners from start to finish, but this never happens. There's a "sweet spot" at about 100 runners per mile (+/- 50%), regardless of race length, where most runners will fit that criterion. In 1999-2000, I did a survey of local races and found that those that had 500-1000 runners finishing were relatively stable. Those that had more than 2000 tended to grow until they became problematic, then suddenly fell apart (the largest races have continued adding races, often on other days - the Twin Cities Marathon now has a 10 Mile, a 10K, a 5K and shorter family events, plus lead-up races throughout the year). Races with fewer than 300 finishers tended to die out, unless they had motivated race directors. Very small races, as they were done in the 1970's, ideally had three volunteers. One would stand at the finish reading out the times while another jotted the times down on paper. A third handed the runners their place, written on something that would stand up to weather; tongue depressors were commonly used, which are essentially large popsicle sticks. After everyone finished, the finishers would then hand their stick back to the person with the list of times, so that their name could be attached to their time. This works well for races of 50-70 runners and okay up to maybe 100. With all the numbers above, one can see that races of only 0.5-2.0 miles would fit the criteria. These distances are almost never run, though it's been shown that 70% of runners' best distances for racing are under 5000 meters (which is why track races have so many sprints and few long races). These very short distances are also good entry points to road racing for beginners, particularly children. No one will travel to go to a short race of odd mileage, so these races will be very local, with the same runners showing up repeatedly, which is what one wants for racing. Also, one can recover from these races quickly, so one can run a lot of them. The last challenge is in getting people motivated to run these and run them as fast as they can - that, I hope, I will cover in the next post. Chances are, if you didn't run on a team in high school, you've never raced anyone while running. You can tell the difference in a photo. These guys, John Van Danacker (leading, on right) and Pat Billig (trailing, left) both finished this 5K in 17:23; they were both vying for the Minnesota state championship for men 55-59, so they've been racing each other for a while. This rarely happens any more, because we've had an entire generation of people who expect awards for participation. Consider the Twin Cities Marathon. In 1982, there were 3511 finishers, with 504 of them finishing under 3 hours and 429 Minnesotans finishing under 3. Last year, there were 7144 finishers, 184 of them under 3 hours, 108 of which were from Minnesota. Breaking 3:00 was 8 times more common then! I think the main reason for this is that there is no incentive to do better - you get exactly the same reward for finishing in 6 hours as you do in 3, so why bother to run hard? There's actually disincentives to run faster in the age class system. In the mid-1990's, I ran the Excelsior Firecracker 10K (one of the oldest races in Minnesota) one year and watched the age class runners as they finished behind me. They'd finish, then head to where the awards were, sitting in order. After talking with them, I found that they knew who they'd be racing beforehand and what order they'd finish, barring accidents. In fact, there were exactly three competitive runners in each age class - the same number as awards - because other fast runners in their age classes chose to do other races where they could win an award, rather than to finish 4th to one of these. They'd all conferred. If you checked the results 10 years later, it's the same names, they just were in different age classes. As long as they're getting awards, they don't quit. I'm not immune to this. Billig, pictured above, ran a 5K under 17 minutes last year. I haven't run that fast this millennium and we're the same age (though I look much older - the unfairness of it all!) So I tend to run races where I know I don't have to race him, because it's pointless. In my race report for the Trail Mix 50K of 2008, I mention choosing to ensure that I'd win the men's race by not going with Eve Rembleski when she caught me, because we weren't in the same race. There's something very wrong with this. So, one thing we need are new incentives to run faster. What we have isn't working. When I started road racing in the 1970's, it was a seasonal sport, held between track in the spring and cross-country in the fall (winter was for indoor track or cross-country skiing). There were few races, so you ran all you heard about; generally you found out about a race a week or two in advance, usually by word-of-mouth at the races you did. By the end of the decade, it was possible to race nearly every weekend, if you were willing to travel and racing oneself into shape became commonplace, as entry fees (day of race only) were $1-3. Races varied between 2 and 10 miles, with little attempt in some cases to accurately measure courses, though larger races tended to 5 miles (later 8K) and 10K and were accurate to better than 0.1 miles, once the first running boom hit in 1976. This cavalier attitude toward race distance seems odd today, when races are certified as to distance, then registered as to record quality (not being too different from start to finish), then sanctioned (the race director stating that the proper course was run and that there were no advantages such as a strong tailwind). There's still a vestige of this in trail running, where courses are so tough that accurate measurement becomings meaningless. Races had 30-100 entrants and, because of the low cost, few frills. Water stops were rare. There was no award for second place, no age classes and no separate awards for women; women were less than 10% of runners in 1975, but everyone knew who they were and despite teasing about "getting chicked," they were arguably more equals then than now. The system worked because you'd see many of the same people at every race. You don't have a feel for what pace you should run a hilly 7.3 mile race, but you know who you were behind and who you were in front of in the last race, so you knew where you belonged. When you finished near someone repeatedly, friendly rivalries would develop and you'd push each other to faster times. This all fell apart with the second running boom of 1983. In a race of 5000, the twenty you knew disappeared in the crowd, you crossed the finish line 5 abreast - so place was immaterial and racing evaporated - and you rushed to your car afterward, to beat the traffic caused by the thousands behind you, rather than hang around and chat with those you raced with. The larger running populace came at the cost of community. I'm hoping to discuss in the following posts what was lost and how I think it can be regained. Like the popular 5-2 Diet, it depletes all the glycogen reserves and creates a huge caloric deficit twice per week and the rest of the week is used for recovery. Of course, the workouts are ridiculously tough and, if you have a bad day, it's half the week that gets lost. This three week cycle gives one an "easy" week, makes some of the workouts more reasonable and keeps the mileage the same. This, adding another 15 miles per week, allows one to do more long hard runs and looks similar to what some elite marathoners do (excepting all the easy workouts to fill in the week). This is what I would actually do if starting a marathon plan. Consistent runs of half-marathon length, frequent miles at race pace and at a duration that's challenging but not overly fatiguing. So, here's the take-away message. I would try the 4 day moderate mileage plan and, if I stopped improving, switch either to a higher mileage plan or to fewer days with longer runs, depending upon what worked best for me in the past.